We've researched dozens of dash cams to bring you our six favorites. For this update we removed the FalconZero, Cobra, Blackcam Hyrbrid, and two Black Box brand dash cameras from our recommendations. Then, we moved the KDLINKS X1 to our best overall recommendation. 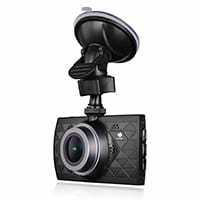 We also added two Garmin brand dash cams and Yi's excellent budget camera as recommendations. When you start shopping for a dash cam, don’t be afraid to take it slow. Dash cams have so many features in common that it can be hard to parse out what makes each one unique. To give you a head start, we’ve researched a number of cameras and chosen six to recommend. 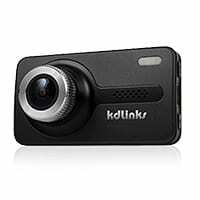 The KDLINKS X1 has all the standard features of a dash cam, with HD video, 1080p resolution, and a 2.7-inch screen. It starts recording when you turn on your car, and the footage loops, erasing older footage. It has a 165-degree field of view. At only a half-inch thick, this camera has a super slim design. The camera can rotate a full 360 degrees, so you can turn the camera to record in any direction, which is great if you want to record an interaction with someone outside your vehicle. The video playback software includes a map and route information for each video, so the viewer can see exactly where an incident occurred. The X1 comes with a high-quality battery designed to withstand extreme temperatures. The X1’s built-in accelerometer will lock down your video recording if it detects a crash, but its sensitivity means that hitting a pothole may also trigger the lockdown response. We also wish you didn’t have to manually set the time, because an automatic time stamp seems like a feature that should come standard with a GPS-enabled device. The KDLINKS X1 checks a lot of boxes for a great dash cam: it has high-quality video recording that can let you read license plates 50 feet away, superior night vision, comprehensive computer software, and a small, discreet design. There are a few features that you might need to tweak to get it working to your satisfaction, but overall it’s a good buy. 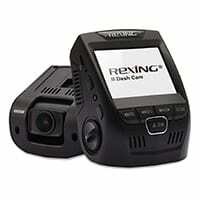 The Rexing V1 has all the standard features of a good dash cam, with a 2.4-inch screen and a nice, wide 170-degree field of view. It records at 1080p, and 30 FPS. It loops the recording, and it has a G-sensor that will lock the video if it detects a crash—but it doesn’t have GPS. The V1 lets you add a watermark stamp to your videos with your license plate number, which is helpful if you ever need to turn the video over to law enforcement or your insurance carrier. The camera has a full 30-second delayed shutoff, so it will continue recording for thirty seconds after you turn off your car. Rexing offers top-notch customer support and a two-year warranty, and some customers even report being able to return their camera for a replacement after the two years were up. The V1 has great sound recording quality, but you can mute it with the touch of a button. This model doesn’t come with GPS, but it does have a GPS hookup if you want to add one. Because of the design, you have to carefully mount the camera so your horizon line is correct. The adhesive tape used for mounting doesn’t hold up well over time or with extreme temperatures, and the night vision isn’t as clear as we’d like. At just under $100, the Rexing V1 is a solid choice if you’re on a budget, but we recommend investing the extra money to get it hooked up to a GPS. It doesn’t have a lot of fancy features, but its drawbacks are minimal, and its strong customer service should take care of any issues that come up. The Garmin Dash Cam 55 comes with all the standard features of a GPS-enabled dash cam, but it’s smaller than most at only 1.5 x 2.2 inches. It has 1440p video capture with a 122-degree field of view, with looped recording and collision detection for automatic recording. Traffic safety warnings will alert you when you get too close to the person in front of you or if you start to drift out of your lane. The Travelapse feature lets you condense a long trip into a brief, sped-up video clip that you can share with friends and family. Sharing video is easy with the dash cam’s built-in Wi-Fi and VIRB app, which lets you stitch together video. The Garmin 55’s field of vision is narrower than other dash cams, so you might not get a good view of what’s happening on either side of your car. The traffic safety warnings can get annoying, especially in stop-and-go traffic, but you can turn them off if they bother you. This model has had some issues with overheating, and it doesn’t do well in extreme temperatures. 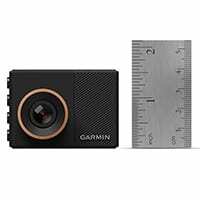 When it comes to dash cams, you want something that’s simple to use while you’re driving and makes it easy to share video when you need to, and the Garmin Dash Cam 55 does both very well. It’s pricier than other models, but its built-in Wi-Fi, hands-free controls, and fun Travelapse feature justify the higher price tag. The Z-EDGE Z3 has all the standard dash cam features but no GPS. It records at 1440p, with a 3-inch screen and 155-degree viewing angle. It has crash detection and motion detection for when the vehicle is parked. While the Z3 doesn’t have night vision, it does have a pretty consistent picture from day to night due to its high-quality resolution. Parking Mode and motion sensors will make the camera start recording if motion is detected or if someone bumps your car, even if your car is off. The Z3 comes with a 30-day money-back guarantee, an 18-month warranty, and lifetime customer support. The included USB adapter has an extra port, so you can still use your car’s cigarette lighter to charge your phone while your dash cam is plugged in. At this price point, we expect to see an integrated GPS in this dash cam, but the Z3 doesn’t include one. The camera also doesn’t have a touch screen, so you’ll have to spend some time fiddling with the buttons and the onscreen menu. And the included USB cord is only for power—you’ll have to purchase a different cord to download videos from the camera to your computer. The Z-EDGE Z3 gets high marks for picture quality, and we really like the motion- and vibration-sensing feature in Parking Mode. These qualities justify its spot in this price range for dash cams, but we recommend getting an add-on GPS unit to give you total coverage in case of an accident. The Garmin Speak Plus is like a tiny Amazon Alexa for your car with all the standard features of an included dash cam. It has an 82-degree field of view, records at 1080p resolution, and has GPS technology. The Garmin Speak Plus mobile app lets you use voice commands to operate the navigational system, camera, and Alexa features. With the Garmin VIRB app, you can wirelessly download photos and video from your dash cam and edit them. You can route your Garmin Speak Plus through your car’s speakers, so you can use Alexa to stream music, play interactive games, and more. The dash cam includes forward collision and lane departure warnings to keep you safer on the road. The Garmin Speak Plus has just an 82-degree field of view, which is half the coverage of less expensive dash cams. You have to use your own phone’s data plan if you want to enjoy the Alexa features in the car, and you have to keep the Speak Plus app running in the background on your phone as you drive. 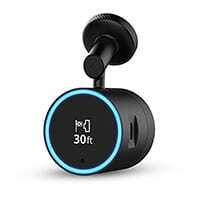 If you’re already an avid Alexa user and you want to enjoy the convenience of a digital assistant in the car, the Garmin Speak Plus is a good dash cam for you. The camera itself isn’t the best quality, but its useful Alexa features and the integrated navigational system earned it a spot on our list. 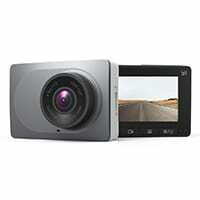 The YI Smart Dash Camera records at 1080p and has a nice, wide 165-degree-angle lens. It’s a little bigger than other dash cams at 3 x 2 inches, but it has all the standard features of a good dash cam, minus a built-in GPS. The built-in Wi-Fi and intuitive app let you download video wirelessly from the YI dash cam. The camera has excellent night vision and an infrared filter to reduce glare. You can set the sensitivity of the collision sensor if you’re getting a lot of false impact detections. The YI has lane departure warnings to help you stay safer on the road. Despite the 1080p resolution, the YI image quality isn’t always great, but you can improve it by rotating the lens and manually refocusing it. The driver lane assistance is often unreliable and will alert you even if you’re driving straight between the lines, so you may want to turn it off. The YI gives you everything you need in a good dash cam, but you won’t get a GPS at this price point. It’s good for getting a basic record of collision events, and we like the wireless video download feature, which is something usually seen only in higher-end dash cam models. If you’d like to have a basic, inexpensive device just in case you’re in a wreck, the YI is a solid choice. it can help mitigate potential spikes in your insurance rate. A dash cam can even help you save good memories or increase your YouTube hits. But whatever side benefits you get from a dash cam, the core benefit is that it provides a rock‐solid, nearly indisputable alibi. You have to buy one first, of course. But if it saves you from even one wrongful citation, a dash cam could essentially pay for itself. These days it may feel odd, outdated, or even extravagant to buy a camera with a single function. Next to a smartphone, a camera can seem so inefficient. But dash cams are sophisticated devices doing a job that other cameras, even professional photographers’ cameras, just can’t do. They’re designed to meet the needs that arise while driving a car—to keep your field of vision clear, to protect yourself from loose items, to be able to monitor the road instead of the camera, and so on. Dash cams are designed to turn on and off with your car, that is if you leave the camera plugged into the cigarette lighter outlet between drives. If you disconnect the camera between drives, just plug it in to power up. For most dash cams, the number of frames captured per second (fps) is 30, but some cameras take 60fps to better capture fast action. Many dash cams start recording the moment they turn on, while others activate the record function by sensing when the car is in motion. Wide‐angle lenses help dash cams see and record more of the areas surrounding a car. Dash cams come with a built‐in microphone to capture audio along with video footage. Many dash cams have some ability to manipulate light within an image while recording so that night shots, high-contrast imagery, and low‐light footage are clearer when you play back the recording. Most dash cams have an LCD screen and the ability to play back video on the spot. Instant playback is one of the most valuable features of a dash cam: it can exonerate you on the spot instead of in the courtroom. Most dash cams attach to your windshield with a suction cup. To keep you from having to manually erase hours of non‐collision footage, dash cams are designed to record over existing footage (starting with the oldest) when the memory is full. Most dash cams take microSD cards with up to 32GB capacity (about five hours of HD footage). Some dash cams are fussy about the class of the card, so read the reviews to see what’s worked for other customers. Most dash cams have a sensor that detects sharp turns, rapid braking, and other signs of collision and then saves that footage automatically or with the touch of a button. Download footage anytime using an SD adapter or USB cable. Some dash cams come with companion software, but not many‐it’s usually your job to find a compatible media player for your camera’s file type. Almost all dash cams record in HD (1080 x 720 pixels or more) to help you see license plates and other details clearly.